These days “greens” can mean any green leafy vegetable and the green market is filled with all kinds – some I grew up and some totally new to me. 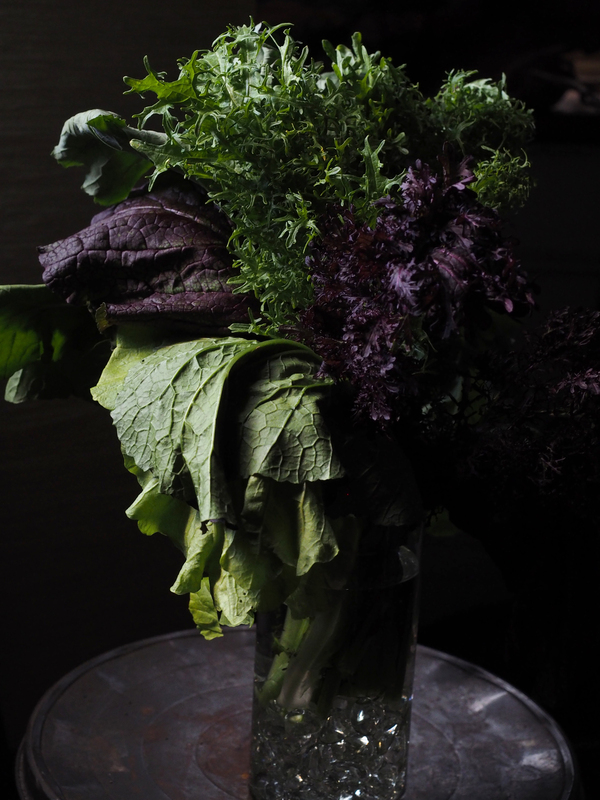 The other Sunday we picked up a beautiful bouquet of mixed greens that the farmer had put together which, once home, I placed in the living room as our floral arrangement of the day. I often do this for the dining room table as I prefer vegetables to flowers as the scent is more conducive to the aromas coming from the kitchen. I have no idea what was in the mix – some things I immediately recognized and others seem totally new. But, once cooked, they came together in a most delicious way. You can, if you like, cook them with bacon, ham or smoked turkey bones, pancetta, onion, or garlic, but I usually just toss the chopped wet greens in a pan with some extra virgin olive oil, mashed garlic, and chili flakes. I don’t cook them for too long – just enough time to wilt and flavor, season with some sea salt, and you have the perfect side dish for almost any meat or fish.